We are currently beginning the process of selecting the venues for our KaraokeFest 2018 singing competitions. The number of hosting locations is limited so if you would like your venue to be considered, please contact Karaoke Scene at the number or email address listed below a.s.a.p. The sooner we hear from you, the better your choice of day of the week, etc. So please contact us now. Sponsorship positions for KaraokeFest 2018 are now available to qualified companies. KaraokeFest sponsors enjoy many huge benefits. This is the perfect way to get your company name, products and services in front of the entire Karaoke community. Sponsorships are limited and will be considered on a first come, first served basis. 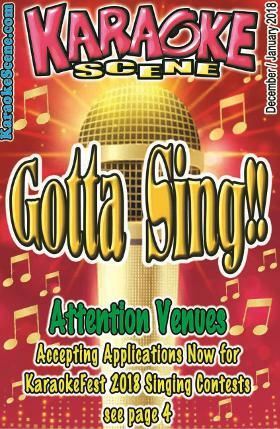 For sponsorship or contest venue information, please call (714) 826-2212 or email us at info@KaraokeScene.com. Space and time are limited so be sure to contact us now! Our ALL “Digital Edition” of Karaoke Scene Magazine continues to be so popular among Karaoke enthusiasts around the world that we continue to have many more digital readers than “paper” readers. Lifestyles have been changing so rapidly and people want their information NOW. They don’t want to have to wait until they arrive at another location to pick up a physical copy of a publication. We have now been serving that need for more than 5 years. Virtually EVERYBODY now owns a cell phone, tablet, computer or another electronic reading device, and very well knows how to use them. This means all of our fabulous features are accessible 24-7 to anyone! You now have all of the features of the former printed edition plus live links to advertisers, products and special videos, etc. Want to know who offers Karaoke shows on a given night? Want to review an article or check out an ad for a product or service? All this and more are instantly available to you anytime you want it. It is the absolute best way to explore the world of Karaoke, any time you wish! Please be sure to tell all of your Karaoke friends how to get Karaoke Scene Digital for themselves. They will thank you for it. There are several ways to access “Karaoke Scene Digital,” by subscription sent to you via email (which includes access to all previous editions as well), and apps for your iPhone, iPad and all Android devices available at the App Store and GooglePlay.com respectively. You can also read “Karaoke Scene Digital” just by visiting our world-class website, KaraokeScene.com. And, of course, it doesn’t have to be either/or, it can be any combination of ways to access and read “Karaoke Scene Digital” that fits your taste or lifestyle. KaraokeScene.com is still offering the “Karaoke deal of the century,” PREMIUM MEMBERSHIP! For less than the cost of a mocha cappuccino per month, you can have a Premium Membership to KaraokeScene.com for an entire year, and it’s packed with benefits! This is a deal you absolutely should not pass up. Be sure to check out all the exciting details by visiting KaraokeScene.com today. Karaoke kongratulations!!! Three time Orange County KJ of the Year winner, Donna Thomas, has raised over $7,600, for the Children’s Hospital of Los Angeles during her annual gala fundraiser at the TomKat Lounge in Buena Park. Karaoke Scene salutes Donna Thomas and all of the many fine folks who unselfishly give so much of their time and money every year to help these children who need it so much. Finally, at this special time of year, it is good for all of us to reflect on the many blessings we receive but take for granted. Try to be kind to someone who may need a little boost. Take a step back and maybe let another person have their way about something. Try sharing the gifts of “love and kindness, warm hearts and an outstretched hand of tolerance” this holiday season. Do this, and it will surely come back to you many times over. All of us at Karaoke Scene Magazine wish you the happiest of holidays and a prosperous, song-filled New Year!